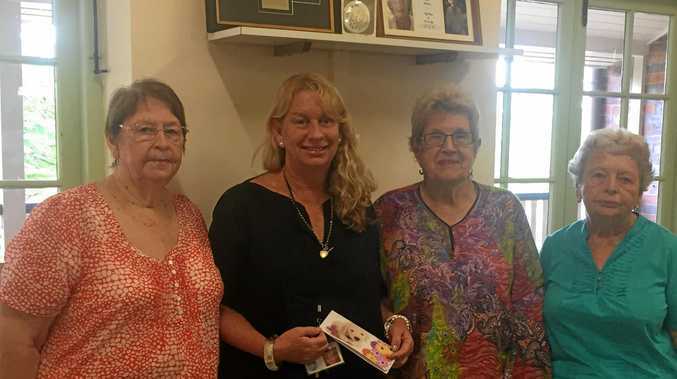 THAT'S A WRAP: Haven Palliative Care manager Sue Manton (second left) with Happy Wrappers organiser Lola Cass (left), Glad Brennan and Glenyce Hartwig. Nothing says Christmas more than a beautifully wrapped gift, and the team of ladies you see every December at Gympie Central offer this service for the princely sum of a gold coin, donating every cent earned to charity. The 50 to 65 volunteers donate their time each year from the start of December right up until Christmas Eve, and Lola Cass's volunteers work all year creating gift tags from pre-loved cards and fashioning individual gift decorations. Formerly known as VOLCAM (Volunteers Assisting Local Charities at Muster), the Happy Wrappers' Christmas gift wrapping from 2007 to 2016 has raised $110,204, of which a massive $54,200 has been donated to Little Haven Palliative Care. Little Haven has a strong history in this community, carrying on the work began more than 35 years ago offering professional nursing care and support to palliative care and cancer patients, 24 hours a day, seven days a week along with support for carers over a 70km radius in the Gympie and Sunshine Coast regions. All Little Haven's care is provided in the home and is given completely free of charge, thanks to the support of the local community and groups like the Happy Wrappers.